Now, my general motivation to recycle and live green is based on scripture which encourages us to take dominion over the earth. I see it as a responsibility to care for the things over which we have dominion. I have dominion over my own home and over my yard. So it would seem to me that I should find the best ways to care for, clean and feed and clothe my family. Secondly, my responsibility is to make sure my family is as healthy as is possible, keeping us within our budget and not being lazy when it comes to providing healthy alternatives to "traditional fare" (such as Kraft Mac-n-Cheese, etc.). I don't want to be fanatical about it and I want to make sure that I'm only trying to take dominion over that which I am directly responsible for. To put it another way - I hate it when people who are not responsible for MY family come up and tell me what I have to do and have to think and have to believe. I don't want to go there because I don't think I should. What I choose to do for and with our family has a great deal to do with our own health and budget and general lifestyle and I assume the same is true for others. Ok, really, this is all leading to a book review. Seriously. I noticed that Peter Pauper Press (a favorite company of the 5 Minutes for Books staff!) had some books on being green and I wanted to check them out. The Little Green Handbook contains "145 Simple Steps to Save the Planet." 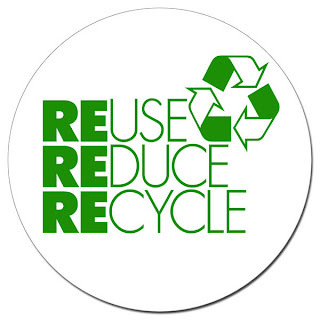 It starts out with the basics of recyclables and knowing what you can and cannot recycle. (This is a helpful list, I think. Of course each region has it's own requirements for what and how to recycle so you'd have to check with your local government to find out how they prefer you to be recycling.) This book contains encouragement for "recycling" your clothes (taking them to thrift stores), getting the most mileage out of your shoes, and how to reuse water! (Dirty dishwasher? If you wanted, you could cart that water out to your flower garden or to the potted flower on your front porch! Walla! You've been conservative with your water usage!) This little book also contains ingredients for making home cleaning solutions that are green. Furthermore, this book is divided up into sections. It offers tips on how to be clean and green at home and it also offers a section on how to make your office more earth friendly. It also offers tips for how to be conservative with resources when you are "out and about" (i.e., shopping) from reusable bags to how to "read" plastics. If you are at the cusp of making a decision to go green, The Little Green Handbook is a handy little book with many practical tips on how to do exactly that. 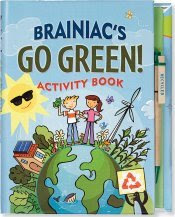 Brainiac's Go Green Activity Book is engaging for children in elementary grades, I would think. (It's a bit above our heads at the present moment!) I don't necessarily agree with the argument for going green which is presented in this book, but they do offer fun tips and activities to kids on how to take dominion over their particular spheres of influence. I agree with the first thing that they encourage kids to do - and that is to "READ, READ, READ!" to learn how to better take care of their environment. The book opens with a Science Word Decoder with a secret code. It has different word scramblers to identify different habitats (like the desert, ocean, etc.). It addresses the problem of smog with a coloring activity, has true or false activities and mazes. The "Plant a Tree" section of this book is filled with dot-to-dot activities of polar animals. If I wanted to draw children into environmental discussions and arguments, I would definitely utilize this book. It's well done to really engage children on issues surrounding care of the planet. Again, my argument is going to be more about taking dominion over that which is ours, but this book fits the bill with a little rewording. Want to convince your kids that it's important to turn the lights off before leaving a room? This book might just be the help you needed (from an earth friendly perspective, that is). Really, the Go Green Activity Book does exactly what it sets out to do which is to entertain children with knowledge. As we continue to learn how to take care of our environment and our family, I am glad to explore a variety of resources. I'm glad to know of what Peter Pauper Press has to offer. What about you and your family? What do you to do be green? Or what prevents you from being as green as you might like to be? I'm curious to hear ideas, suggestions and thoughts if you wouldn't mind sharing! It did not take my kids long to learn the recycling symbol meant Do Not Throw Out! Now they always check items to see where to place it. Here where we live, we can throw all our recycling into one big bin and it is taken to a plant that does the sorting. I try to use environmentally friendly dish soap, shampoo and laundry detergent. But my biggest peeve is the plastic sack debacle, I like use my fabric bags and not only can I reuse them but I can also WASH them! And although companies have gone overboard in their prices for their "green" bags, you can always find cheap fun ones! Oh, and Jack Johnson singing the Three R's song also makes my kids love to recycle! That activity book sounds adorable!